Mitch Fleischer, MD, and Karl Robinson, MD, with homeopaths from Central America at La Escuela Homeopatica de las Americas. 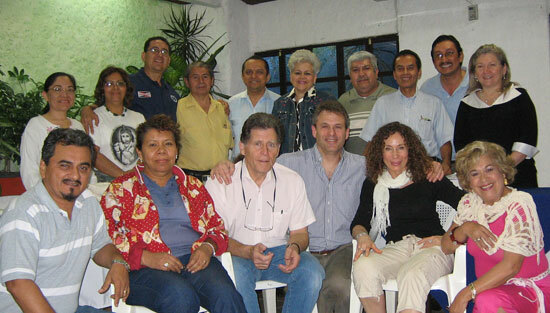 In February 2009, I traveled down to El Salvador and Guatemala at the invitation of Dr. Karl Robinson to participate as visiting clinical faculty for La Escuela Homeopatica de las Americas (The Homeopathic School of the Americas). My goal was to impart to the Central American homeopaths an introductory understanding of the newer methods in homeopathic case-taking and analysis as developed by clinicians in India and Europe, and which I have successfully employed in my practice in Virginia. Needless-to-say, it was quite a bit of work condensing the essential elements of my several, cured cases, averaging 18 written pages apiece, into the one page, typed notes that were requested by Dr. Robinson as group hand-outs. However, the process proved to be very educational for me, as well as for the seminar participants as condensation provided clarity as to what was fundamental, unique and extraordinary in these new, evolving approaches to homeopathic practice. We were very grateful for the amazing, instantaneous translations provided by Dr. Carola Cuenca, a vivacious, homeopathic naturopath from Santa Cruz, CA. In fact, the success of the teachings was made possible by her phenomenal acumen with English-Spanish communications, as well as her comprehension of homeopathic philosophy. We first taught in San Salvador to a group of a dozen or so students. I found them to be warm, friendly, down-to-earth, very inquisitive, eager to learn and an abundant sense of humor. The first day consisted of six cured cases, taken and analyzed from the classical approach, including Nux vomica, Arsenicum album, Belladonna, Tuberculinum bovinum, Sabadilla and Mercurius iodatus flavus. Copies of the condensed histories were provided and the students were given the opportunity to study the cases, then present their analyses and justify their prescriptions. Thereafter, copies of my case analyses, curative prescriptions and case follow-ups were handed out and we reviewed them in quite some detail. On the second day in San Salvador, I introduced the students to eight cases taken and analyzed from the perspective of non-classical homeopathic methodologies, which, in my practice, are a synthesis of the methods of Sankaran, Scholten et al. Again, copies of the histories were provided and the students were given the opportunity to study the cases, then present their analyses and justify their prescriptions. I then presented my analyses and prescriptions for the cured cases of Ammonium bromatum, Ammonium muriaticum, Magnesium bromatum, Magnesium muriaticum, Magnesium phosphoricum, Chromium muriaticum, Chromium phosphoricum, and, finally, a bonus case of Chininum sulphuricum from which to illustrate the juxtaposition of the plant and mineral kingdoms. A lively discussion then ensued about the nature of homeopathic symptoms, the new broad classification of constitutional states as existing within either the mineral, plant or animal kingdoms and the sub-classification into subkingdoms, families, geneses and species, or, in the case of the mineral realm, into the rows and columns of the periodic table of the elements according to the stages of human development. As it turned out, this was an excellent exercise for me in organizing, consolidating and conveying, clearly and concisely, the depth and breadth of my understanding of and clinical experiences in the application of the new methods of case-taking and case analysis. I learned quite a bit from teaching that I didn’t know that I knew. It was exhilarating and humbling. On the morning after the San Salvadorian seminar, one of the MD participants, nicknamed “el coyote, who was a big help to Dr. Robinson in organizing the seminars, convinced us to take the cases of an elderly gentleman with metastatic gastric cancer and a middle aged peasant farmer with early Parkinsonism. Drs. Robinson, Cuenca and I took the cases together in the restaurant of the hotel in sort of an open, informal manner. Using simultaneously both the classical and the new methods – which I’ve entitled ‘Thematic Analysis’ – we came to some quite reasonable remedy choices, i.e., Cadmium arsenicosum for the stomach cancer case and Phosphorus album for the Parkinsonism case, with Causticum as a next remedy if the Phosphorus failed to act. Karl was quite impressed by the lucid logic of the thematic analysis process in quickly ascertaining the prescription of Cadmium arsenicosum. The next leg of our journey took us to Antigua, Guatemala, a lovely, ancient colonial city that is an international tourism hotspot. Along the 180 mile car trip up north, Dr. Cuenca sighted a group of wild animals next to the roadside and shrieked with joy for us to stop and see them. To our mutual delight, it was a traveling circus with cages filled with lions of all ages, leopards, pumas and tigers. The circus owner was taking a small family of miniature hippotami for a stroll and we got to pet them and take photos together. It was a really fun surprise in the middle of nowhere in El Salvador. While in Antigua, we had another lovely surprise. Karl happened to stumble into two old friends in the central park of the city, Heather Knox, a well-known homeopath and her husband Greg Kemp, both Canadians now becoming residents of Guatemala with the intention of founding a village home for orphans. Heather and I have crossed paths and shared laughs many times at the seminars of Rajan Sankaran and Divya Chabra, for whom she provided computer visual aid support with MacRepertory. Heather, Greg, Karl, Carola and I shared a wonderful, traditional Guatemalan dinner together at a famous Antiguan restaurant and caught up on the latest news in the homeopathic community. Heather and Greg are the co-executive directors of Project Somos Children’s Village, a wonderful endeavor to raise children with higher consciousness, including homeopathic care. I encourage you to learn more about this worthy project at http://www.projectsomos.org. We then moved onto Guatemala City, a moderately large metropolis. Our lecture venue was in the spacious rooms of the Central Spanish Club, an upscale country club. On the first morning, the two dozen students seemed to us to be a bit more reserved, not exhibiting the same degree of enthusiasm as we had experienced in San Salvador. It could have easily just been the fatigue common to busy doctors. But, on the second day, they really brightened up and were fascinated by the cases taken with the new methods; they asked many questions about how to put this new knowledge into daily practice. On the last evening in Guatemala City, Karl asked Carola and me to assist him in taking the case of one of the older students who suffered from poorly controlled diabetes mellitus, peripheral edema and other chronic maladies. He had been given several remedies by other homeopaths over the years without any significant changes, although he seemed to be such a classic Sulphur personality. Interestingly, though sadly, his case history revealed a story of high idealism and morality dashed by life’s disappointments leading to anger, bitter resentment, long held grudges, hatred and cycles of doom and gloom. This strongly spoke to the need for a salt of Ammonium. His witty egotism, jesting, garrulousness, unfulfilled craving for appreciation and praise, slovenliness, aggravation by heat and desire for sweets confirmed Sulphur. Therefore, he was prescribed Ammonium sulphuricum. We’re awaiting the follow-up. I now have a heartfelt connection with my fellow homeopaths and new friends in Central America. I very much look forward to returning. The volunteer teaching work with Homeopaths Without Borders was filled with very gratifying moments. I would highly recommend it to other skilled practitioners in the U.S.
~ Mitchell Fleisher, M.D., D.Ht., D.A.B.F.M.